Baked fish filet with panko breadcrumbs. White fish is soaked in buttter, coated with bread crumbs and spices, and baked. 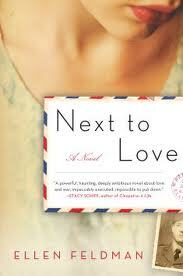 Though the three women in Next to Love are good cooks, they would never consider themselves chefs. They simply get dinner on the table, as well as breakfast, lunch, pot luck suppers, and weekend barbecues, while dealing with whatever else is going on in their lives. Millie faces a crisis with her son while baking brownies. Grace cries into her pot roast and flirts with infidelity while setting the table. And Babe has an epiphany when a recipe goes awry. a woman of my protagonists’ era, had a fast and easy recipe for firm fleshed white fish. The single alteration I have made to it -– replacing ordinary breadcrumbs with panko, a crunchy Japanese version — would have shocked the women in Next To Love. Not only was panko unknown in American households at the time, but during World War II, no self-respecting housewife would have admitted a Japanese ingredient into her kitchen. Government pamphlets and service magazines made a woman’s duty clear. Feeding her family a wholesome all-American diet while avoiding waste and enemy products was as essential to winning the war as our ships, planes, and fighting men. Here is my mother’s recipe, adjusted for current sensibilities and palates. I call it Victory Fish, which is the kind of name magazines and newspapers would have used during the war. milk to cover, and soak in refrigerator overnight, or at least several hours. 2. Preheat oven to 400°F. Oil a baking dish. 3. Remove fish from milk. Coat with bread crumbs and spread in single layer in baking dish. Sprinkle with thyme, salt and pepper.